Basketball is one of the most popular sports in the United States. It is played on playgrounds, driveways, and in gyms everywhere in the country. Of the four major sports, it is the only one you can really play alone, and it's relatively cheap to start given you only need a ball and to find a hoop somewhere. The organized sport of basketball starts out young with lowered hoops and smaller balls, progressing to full sized around age 10. It is also the one of the sports where the collegiate version could arguably have more fervor and popularity amongst fans than the professional level. The NBA has around 450 active players on 30 teams. They are of all ages from 19 to 40 and come from numerous countries around the world. Every year the NBA drafts two rounds of 30, not all make it to rosters and only 15-20 are seniors. About 1000 college seniors will go undrafted each year, 200 of them gaining All-Conference honors for their playing. A few will have been McDonald's All-Americans in high school, some may have been All-American while in college. Unlike MLB, which has a terrific minor league farm system, these talented basketball players have no where to play professional ball domestically. They usually seek opportunities abroad in Europe, China, or South America where they can make a decent living, but are far from the spotlight of the NBA or even American eyes. Fans of college basketball are often left to ask “What ever happened to …?” or “I wonder what … is up to?”. Michael Wranovics, CEO and founder of the brand new Basketball Alumni Legends League (BALL), had those same questions about player Arthur Lee of Stanford. In 1998 as a junior, Lee helped lead the Cardinals to their first Final Four appearance since 1942. In 1999, Lee led the team to their first PAC-10 Championship. However, after graduation Lee went undrafted despite terrific statistics eventually playing for numerous clubs all over Europe, but never again in front of his beholden Stanford fans. Wranovics created the BALL as a league where former college stars can have the opportunity to play professionally in the local markets where they defined their collegiate careers. This will also give the fans the opportunity to continue to see their favorite players compete post-college. The league will run off-season, in the summer, so as not to compete with the NBA or NCAA, and give those players involved the chance to play on their oversees teams as usual. Teams/cities are being chosen based on geographic centricity around college basketball hotbeds. Philadelphia makes perfect sense to host one of those teams, with the Big 5/City 6, alumni, history, and basketball players we have. Other teams are being pooled from broader regions, but they still make sense as a group. The arenas are going to be intimate at around 4000 seats and in the summer they need AC. That excludes the Palestra, sorry. Who'll actually be playing on the teams? First and foremost, these are true home town teams. Each city's team is assigned a group of schools they can pull alumni from centered around that town. You can't play for a team unless you went to one of the schools they are assigned. For example, the Philadelphia team will pull from Villanova, St. Joe's, Drexel, Temple, LaSalle, and Penn. After that initial requirement, the player has to have exhausted his NCAA eligibility, no leaving school early to play. He also can't have a current NBA contract, this is a league for those who might still have a chance. The players will mostly be aged 23-28, give or take, and they'll almost all be All-Conference talent or even All-Americans. Most players will be given invitations, but open tryouts for walk-ons are anticipated. There is so much talent out there to choose from Wranovics says it will be difficult to narrow it down to create the rosters. Next year in 2013, there will be a a soft launch with a short schedule and four teams. Philadelphia will most likely be one of those teams with Washington D.C. and two others to be determined. 2014 will bring a full schedule of 20-24 games and 8 teams concentrated on the East Coast. 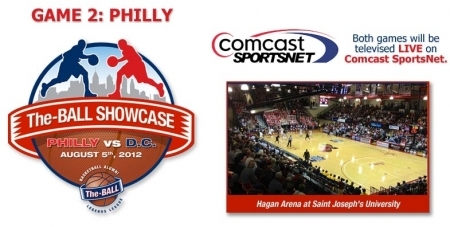 This August there will be a special showcase of two games between teams from Philly and D.C. They will happen on August 4th and 5th. The game on the 4th will be at the Charles E Smith Center on the campus of George Washington University at 4pm. The game on the 5th will take place at Hagan Arena on the campus of St. Joe's in Philadelphia at 8pm. Both games will be broadcast live on Comcast Sportsnet. Tickets are $5-20. Students get in FREE to both games if they arrive at the game with their Student ID and wearing School Colors! They'll get to sit in a special camera facing sideline student section. Allan Ray (Villanova), Curtis Sumpter (Villanova), Tasheed Carr (Saint Joseph’s), Pat Carroll (Saint Joseph’s), Dwayne Jones (Saint Joseph’s), Ryan Brooks (Temple), Dionte Christmas (Temple), Ramone Moore (Temple), Dustin Salisbery (Temple), Mark Tyndale (Temple), Rodney Green (La Salle), Frank Elegar (Drexel). Before the Philadelphia team can take the court, the BALL is asking everyone in Philly to name the new team. Tweet @TheBALLhoops with your suggested name for this new basketball team and you can win FLOOR seats for you and 10 others for the August 5th game. Multiple entries will be accepted, so started sending in your suggestions. You'll also get to meet the team you just named. This particular game is of special note for two members of the Philly team. It will be the last professional game for Curtis Sumpter and Pat Carroll. They will be moving on from basketball to other positions. Come out and support these past Big 5 greats and all the players. This new team in Philadelphia will give every college basketball fan in the city a great place to go in the summer to see promising young talent who thrilled us for four years on separate teams come together as one and continue to showcase why this is one of the best basketball cities in the country.